You haven’t led if you haven’t felt embarrassed. Sadly, egocentric fear of embarrassment blocks exceptional. Embarrassment freezes you in your tracks like a deer in the headlights, afraid to move. Embarrassment reflects concern for another’s judgment or opinion. That’s not all bad. The more others judge your contribution as helpful, the more impact you enjoy. The trick is staying focused on your purpose in a world of diverse opinions and judgments. being pushed around by irrelevant opinions. People who brag they don’t care what others think lie. don’t have to say they don’t care what others think. Leaders listen to opinions that matter. Anyone who has done anything of significance has felt embarrassed. Remain focused on the reason you stepped out in the first place. You’re trying to make a difference. The deadly power of embarrassment is its ability to obscure purpose. Never solve embarrassment by embracing someone else’s goal/purpose for your leadership. Prepare diligently. Willing to be embarrassed never justifies laziness or lack of preparation. Execute with energy. Tentative movements invite criticism and increase embarrassment. Timidity anticipates embarrassment and pulls back. Stay vulnerable and in tune with your heart. Lack of vulnerability causes you to lose yourself. Enlarge your circle of friends. Find supporters who share your values and vision. Consider the source. Is ridicule coming from arrogant asses sitting on the sidelines? Ignore them. Choose goals that matter more than embarrassment hurts. I spoke at a High School graduation in a Federal Prison. I honored the graduating prisoners by pointing out they had been willing to fail and feel embarrassed in order to reach their goal. You have to be willing to say you failed your history test in order to pass it. 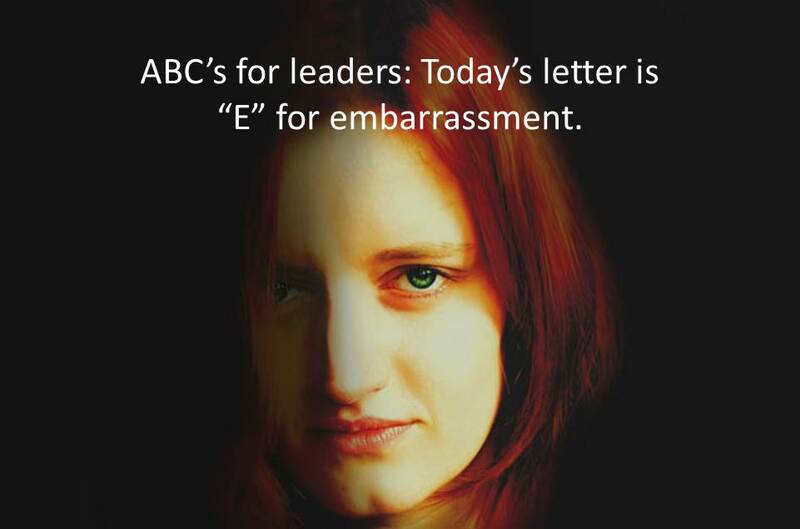 How can leaders deal with embarrassment? Check out the great list of leadership E’s on the Leadership Freak Facebook Page. While you’re there, add leadership F’s for tomorrow’s post. I love your suggestion of anchoring oneself in the larger goal and purpose, to mitigate against the fear of failing, or embarrassment. Ideally the desire and motivation to achieve the goal/purpose, will be stronger than the fear of failure or shame, and this will keep the potentially paralyzing effect of fear of shame from carrying the day! You offer some sage advise for leaders on how to manage their own fear of embarrassment. Feel free to share your wisdom with respect to a leader’s role in ensuring that fear of embarrassment is not getting in the way of people speaking up, of challenging status quo… of innovation or creativity or independent thinking…. Thanks for inspiring my thinking yet again! Hi Lori. You’re thinking like a leader when you explore how these ideas apply to members of your team. Thanks for pushing my thinking. Great stuff today Dan thanks!!! Seems embarrassment’s base is fear! Alrighty then!!! Strung out from the base PRIDE!! If you really knew who I really think I am you would know I ain’t much!!!! So I pretend! Puff out my ole ego!!!! When the pretend is discovered it is just Little ole me! Like the friendly little guy behind the projection screen, you know The Wizard of Oz? Behind the projection of his ego just an average clueless bozo on the bus just like the rest of us! Silly Wizard and his projections! You think the Dude writing that movie was writing metaphorically? Ya think? Ok word for the day! E word!! Ethology- study of natural or biological character! Once you really know who you really are it is spectacular!!! Ok can just speak for me and my experience!!!! Spectacular!!!!! Just a footnote, the science dudes have figured out we all have 64 strands of DNA!! They have also determined we have only activated 20 in our human development so far!!! Meaning? More to be revealed!!!! How cool is THAT???? What will we be like operating this spiritual machine firing on all 64 strands? Wowza, just consider the possibilities!!!! Shifterp back to the fight for Truth, Justice and People Centric Leadership for All!!!! My hope for you today is another strand of your of DNA switches on!! Or you just have a great day! I AM!!!!! Like the correlation between the Wizard of Oz n lil-ole-me Scott! How about the 44 not switched on strands of DNA???? Wrap your 3 pounds of grey matter round DAT!!!!!! I figure two things are gonna happen. One I love, the second not so much!!! Wonder how ridiculous the Leadership conceits that create 70% employee disengagement is gonna look then?? Already stinks pretty bad to me NOW!!!! Lol. People centric leadership!! Live it breathe it, be it!!! It works better, promise!!!!! First women are gonna be infinitely more beautiful than they already are and our heads are gonna be much much bigger to handle more info!!! Sp back into the fight!!!!! Frolicking all the way!!! Thanks Scott. I’m thinking about including the problem of mask-wearing in tomorrow’s post. The wizard of oz is a great example. The raw vulnerability is so key to staying grounded…yes, the arrows of criticism can hurt more when you purposefully remain vulnerable. But on the up-side, your critics assist you greatly by pointing out minor failings and areas for improvement. Great, thoughts! Thanks for adding the positive potential of criticism. Best for the journey. I believe those who avoid embarrasment at all cost do so out of fear of being ‘found out’. These folks don’t want others to know their short comings (for fear) others may think they do not have all the answers. “None of us have all the answers for gosh sakes”. This stiffles your ability to build a solid sence of community with your people, they’ll feel if your not able to admit your human frailties, why should they. It’s at that point that sharing true emotion and opinions come to an abrupt halt. You pointed out several excellant points Dan. #1 Seek out and surround yourself with like minded people who share your vision. #2 Never ignore the opinions of those who DON’T share your valuess. Just because others do not always agree with you does not mean their insights are not valuable. “Hava great weekend my freind”! With ya Steve-a-Reno!!! Steve-a-rooski Making copies!!!! Remember that on SNL? Yeah try just being a real human being!!!!!! Chevy chase said sumptin close to that in Seems Like Old Times, great flick! Cya Steve good info thank you sir. One of way to deal with embarrassment is to introspect the reason. If the reason is within our control, we should try to ensure that it does not repeat. When reason is beyond our control, we need to learn how to avoid it again. I also believe that embarrassment hurts those who really think it negatively. There could be other way to think. One should take it in positive perspective. I agree with you that purpose focused person generally does not carry away with embarrassment. So, one should have purpose so powerful that energy to drive purpose should be much more positive than energy to drive embarrassment. One important leadership quality is effective in dealing with embarrassment is patience. Generally, we tend to lose patience in negative or unfavorable circumstances. So, one should have patience to accept the embarrassment. The problem aggravates when we do not want to accept the fact. So, one should own it, if possible publicly. I believe that ” those are not successful who have touched the height” but successful are those, who have bounced back after hitting the bottom”. So, one should have patience in embarrassing situation with a willful promise to bounce back. Thank you for sharing your god dependence rather that self dependence!!! We Double A folks do that or perish! Kinda cool really!!! “That’s uncomfortable, but allow me to finish my point, then we can review if need be..” 70% of the time you then just move past..
How can leaders deal with embarrassment? Good question. Here’s what I think works. 1. Be honest about it. You can’t hide embarrassment, so embrace it. 2. Be self-deprecating. If possible, take the embarrassment with some humor — at your own expense (it will pay back later). 1. I am still the leader and the people who work for me depend on me. There are times I have to remind myself who the boss is. 2. I am embarrassed because I took a risk and failed. Odds are I have done it 10 times and succeeded 9, so I remind myself of the odds. True keeping things in perspective is a key in overcoming embarrassment. Always be able to laugh at yourself. Who’s that picture of? She looks like a cook from Montreal I used to work with. Useless comment I know, but is it her? Not sure who the person is. Thanks for asking. I’d forgotten to put the link on the image. Your question reminded me. The Alphabet Again???? Haha, embarrassment, such an unusual topic! well, maybe, leaders should be embarrassed once in a while, eh? Thank you for this article! It makes a lot of sense. I’ve been in several embarrassing situations. Dan, this is an easy favorite. I especially liked “Find supporters who share your values and vision.” I’m finding out that this blogging journey I’m on is much easier and much more fun when I have some friends along for the ride! Great point. Far too often those that are not even in the game are quick to point out failures and setbacks. I think the sign of good leadership is being able to maintain professionalism despite how blatantly disrespectful this behavior can be. Thanks for sharing! I so agree with you – that still small voice has recently pushed me into a potentially excruciatingly embarrassing situation but hey when I faced it and said my piece it was not embarrassing at all. Courage to speak freely with discernment is so liberating and also gives freedom to others to speak their truth.